Did you see the “The Helpful Hunt”? It’s a scavenger hunt that kicked off during a commercial in the Big Game. SoCal residents completed the scavenger hunt and at the end nominated someone they thought deserves a brand-new Civic. And we’re still giving away more Civics. 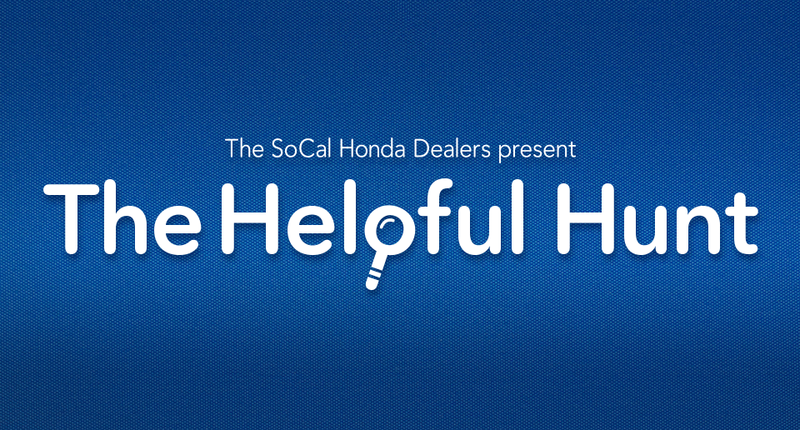 Make sure you’re following us on Facebook (Facebook.com/SoCalHondaDealers), Twitter (@HelpfulHonda) and on Instagram (@SoCalHondaDealers) to find out who we are surprising next with new car. Want to request a Random Act of Helpfulness? Share your story at http://www.saocalhondadealers.com/help-me-honda.